With its strong historic ties to royalty, science, and seafaring Britain, Greenwich makes for a fascinating daytrip without ever having to leave the city of London. Of course, the area is best known for lending its name to the Greenwich Meridian and Greenwich Mean Time (GMT). In fact, the cluster of historic attractions in this small space is so special that UNESCO named Greenwich a World Heritage Site. Situated on the south bank of the Thames across from the Isle of Dogs, Greenwich is easily accessible by tube via the DLR, which stops at the edge of historic Greenwich at Cutty Sark station. More adventurous visitors can access the area via the Victorian-era Greenwich foot tunnel, which links pedestrians from the northern bank of the Thames to Cutty Sark. The Cutty Sark ship itself, wedged into a massive glass platform, is one of Greenwich most recognizable icons. Built in 1869, Britain’s last surviving tea clipper recently underwent significant repair after a 2007 fire and can now be visited – even from beneath its massive hull. The collection of buildings lining the Thames just east of the Cutty Sark make up the Old Royal Naval College, designed by Christopher Wren in 1694. These buildings were erected on the site of the demolished Palace of Placentia, a royal palace built in the 15th century by the Duke of Gloucester – the man also responsible for enclosing the nearby Greenwich Park. The palace went on to become the birthplace of several Tudor-era royals, including King Henry VIII. The Old Royal Naval College was originally built as a medical facility, and was known as the Royal Hospital for Seamen at Greenwich, until it became a Naval College in 1869. These days, the buildings not open for visitors are used by Greenwich University and the Trinity College of Music. The most popular attraction at the College is the Painted Hall, where the former dining hall’s painted ceiling is an impressive sight. Also open to visitors is the Chapel and the Nelson Room, where Lord Nelson lay in state before his funeral in 1806. For a fun, in-depth look at the history of Greenwich as a whole, head to the Pepys Building where the Discover Greenwich exhibition is on display. Admission to the Old Royal Naval College is free. Perfectly framed by the buildings of the College is the Queen’s House, a fine example of British classical architecture from the 17th century. The house was once the royal residence for the wives of Kings James I and Charles I, and is now used as an exhibition space for paintings from the National Maritime Museum. The main building of the National Maritime Museum can be found next door, just west of the Queen’s House. Here, over 500 years of Britain’s seafaring history can be explored, through maritime art, maps, and navigational instruments. Several remarkable boats are also on display, such as the speedy Miss Britain III, a record-breaking boat from 1933. 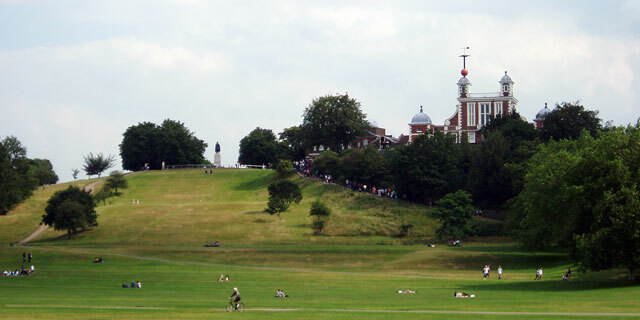 South of the museum and the Queen’s House is one of London’s oldest royal parks – Greenwich Park, home to the Royal Observatory. The northern section of the Royal Observatory complex is devoted to horology, that is, the study of measuring time. It’s here where the Prime Meridian is famously marked with a steel strip along the ground, dividing the globe into Eastern and Western hemispheres. At night, the meridian is marked by a green laser shooting across the sky of London. Today, more modern methods of measurements place the true prime meridian some 100 metres east of the Greenwich meridian, and Greenwich Mean Time has, in many cases, been replaced by the more precise Coordinated Universal Time (UTC). However, the historical importance of the Royal Observatory remains a huge draw. The Flamsteed building, named after Astronomer Royal John Flamsteed who worked in Greenwich, is at its heart. On top of the Flamsteed building is a time ball, which drops every day at 1pm to signal the time, as it has since 1833. Today, this old method of time signalling is most famously used at the Times Square ball drop on New Year’s Eve. The Royal Observatory is also home to the UK’s largest refracting telescope, a planetarium, and an astronomy centre.